Photo Booths are becoming more popular at wedding receptions. They are a great way for your guests to have some fun. Photo Booths are a form of entertainment – the ultimate selfie. Here are 5 tips for a successful photo booth at your wedding –guaranteed to pump up the fun. The best time for a photo booth is after dinner because it gives people something to look forward to and the guests are generally in the party mood after dinner. Photo booths are most often booked for 3 hours. The best times are from 9pm to 12am. Additional hours can be purchased but most people are able to get their photos taken in the booth within 3 hours. Another option for the photo booth is to provide entertainment during a long cocktail hour. The photo booth can be reserved for 3 hours prior to dinner so the guests can have some fun while the couple are off getting their professional photos taken. The best location to place a photo booth is inside the room where the action is. But don’t have it too close to the dance floor. The volume of the music might be to loud because the photo booth is an area where people gather to talk before they get their photo taken. 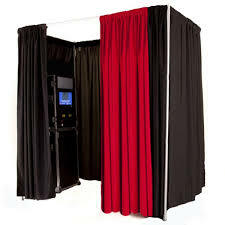 Photo booths range in price depending on the services that are booked. Professional companies will offer the photo booth starting at $800 and go up to $1200. There are two types of photo booths – Enclosed (photo below) where you step into the photo booth area that is surrounded by pipe and drape and nobody sees you getting your photo taken. The most popular and most recommended type is the open concept (photo above) because everyone can see you get your photo taken which entices other people to get their photos taken and have a few laughs. Props are offered by some companies including Quality Entertainment. 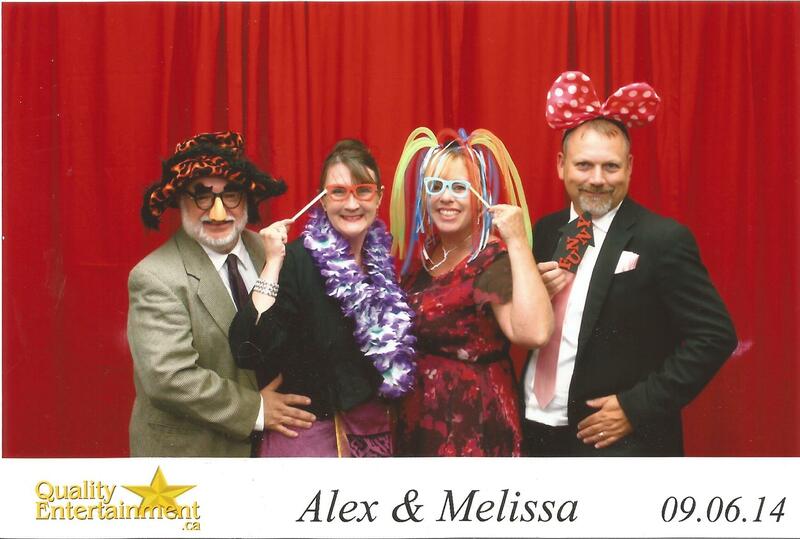 Props add to the silliness of the photo booth experience and give you a fun memory to take home. You can even bring your own props to match your theme. Make sure to have a high quality fast printer. Waiting for a printer to produce a photo will make everyone wait longer and lose the momentum. An option for additional cost which can be fun to purchase is double print photos. Now your guests get to keep one and you can keep one. I was at one wedding where we took the couple’s print and pasted it into a scrap book they provided and then we wrote a message from us to the couple. My son will be using the couple’s print to send as a part of the thank you card following the wedding. The type of photo booth companies will vary. The better companies, like Quality Entertainment, will have an actual photo booth unit that has a screen where you can see yourself. It adds to the fun to see yourself first. Discount companies will simply have a camera on a tripod attached to a computer and printer.